SPRUCE CREEK, FL - Yes, the Darling family, at the heart of J. M. Barrie's imperishable "Peter Pan," is back. And once more, the little boy who wouldn't grow up is diverting those who haven't yet grown up (and their parents), this time at the Theater at Cypress Creek Elementary School. The famous theatrical play of Peter Pan by J.M. Barrie was performed by the students of Cypress Creek Elementary School in Port Orange. The ensemble included a large number of Spruce Creek Fly-In kids attending the popular school. The medium for telling the tale 101 years after its first appearance onstage is this production starring 9-year-old Nicole Bravo, who played the role of Peter Pan. The story, for those who have not seen some version, is of the playful spirit who is Pan (Nicole Bravo). He comes visiting the children of the Darling household from the mystical place called Neverland. After Pan loses his shadow (Meryl Liu), Wendy Darling (Chloe Arlow) helps him get it back and Pan ends up bringing all three children flying with him back to his Neverland. Neverland is comprised of smaller regions, one with Indians, one with pirates, one with the foundling Lost Boys. Pan is in a constant war with Captain Hook (Zachary Fedea). He fights Hook while trying to play father to the Lost Boys who need a mother. Pan wants Wendy to be a mother to the lost boys. Tink (Marta Zerukha), though incompatible with Peter, is jealous of female competition for Peter's attentions. This Tinkerbell played a delightfully sweet role despite the writer's original intentions of a mischieving fairy. But despite the famous resurrection of the moribund Tinker Bell, the perils of the lagoon in Neverland, the conflicts between Lost Boys and Indians, the menace of poisons and crocodiles, and the vigorous dances of Tiger Lily (Nikki Nguyen) and the Indians, the show grips the audience when Zachary Fedea as the comically villainous Captain Hook appears, assisted by his sidekick, Mr. Smee (Hallie Williams). The show culminates with one last encounter with his archenemy Peter pan. Pan has his final bout with Hook in a sword fight which he deftly wins to the cheers of the Lost boys, Indians and the Darling children. This is a feast for the eyes and these kids have made an unforgettable performance. 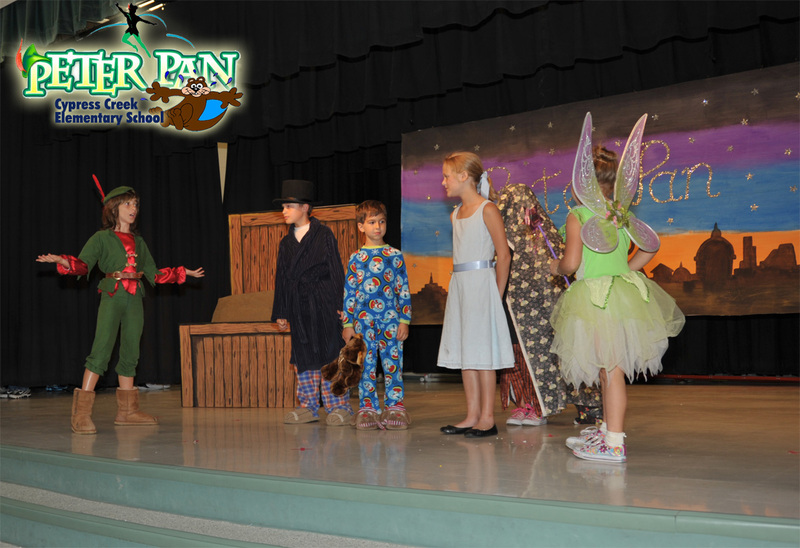 The shows were held May 27th and 28th at the Cypress Creek Elementary School's Auditorium. The producers were teachers Kimberly Krivich and Julia West. The cast included students from Mrs. West's First Grade Class and Ms. Krivich's Fourth Grade Class. Nicole Bravo, the daughter of Carlos and Patricia Bravo, is an accomplished pianist and straight-A student and this is her first theatrical performance. The Bravos operate Karlhaus Realty based at the Spruce Creek Fly-In. Karlhaus is an exclusive worldwide real estate consultancy boutique that markets Spruce Creek Real Estate. Headed by Principal David Butler, Cypress Creek Elementary School is located on Williamson Boulevard just east of the Spruce Creek Fly-In. This Volusia County school is the newest in the network and enjoys modern facilities and sports grounds, including a media room and library, auditorium, cafeteria and modern classrooms with the latest in electronic communications. Computers available throughout are connected to the school's network and allow the students use of state-of-the-art technologies in their learning. The school's famous music department has an ensemble (The Otters) that performs a dynamic percussion show at various events for the local community. The Curriculum covers Kindergarten to Fifth Grade. Cypress Creek is among the few public elementary schools in Florida to receive a distinguished GreatSchools Rating of 9 out of 10.